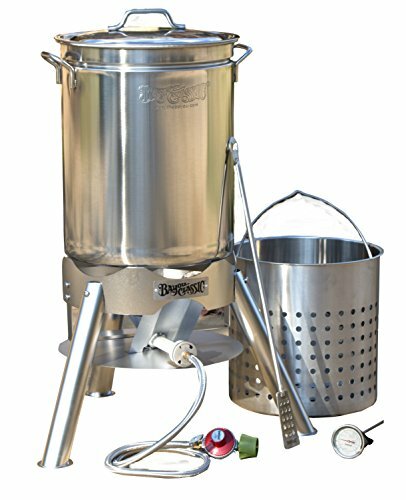 The Eastman Outdoors Stainless Steel Outdoor Cooking Set is a serious machine for those who like to deep fry turkeys and other meats outside. Running on propane, it’s intended for outdoor use only. 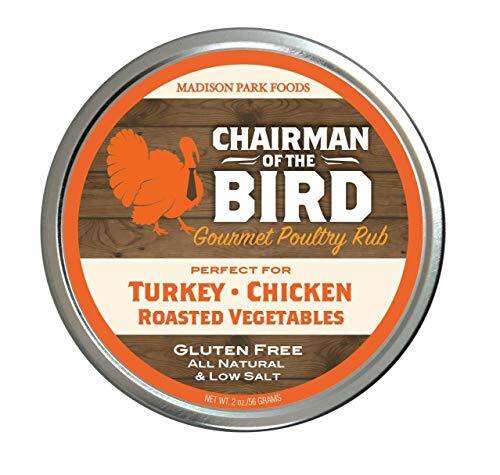 It includes everything you need to fry turkeys or other large cuts of meat except the propane tank. 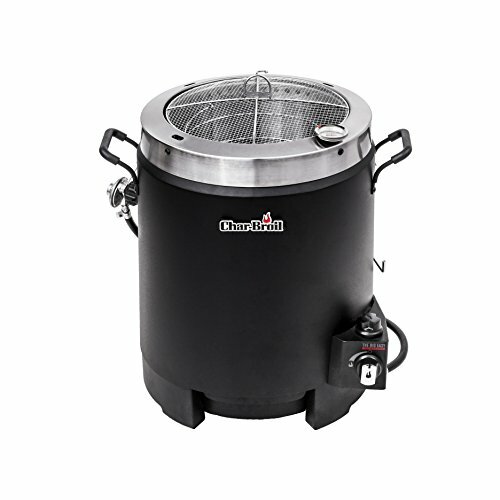 https://www.lovedeepfriedturkey.com/category/outside-turkey-fryers/This outdoor turkey fryer is one of the best that money can buy-but is it worth the hefty price-tag? Keep reading to find out! 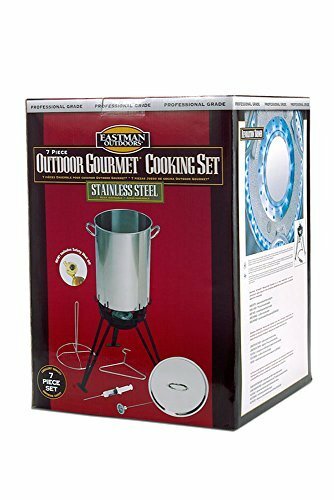 What really sets apart the Eastman Outdoors Stainless Steel Outdoor Cooking Set from the competition is the quality- the stainless steel pot is extremely durable, unlike some of the thin aluminum ones and it will last you for years. Stainless steel pots are used in restaurants and other commercial kitchens because they are easy to clean and will stand up to some serious wear and tear. 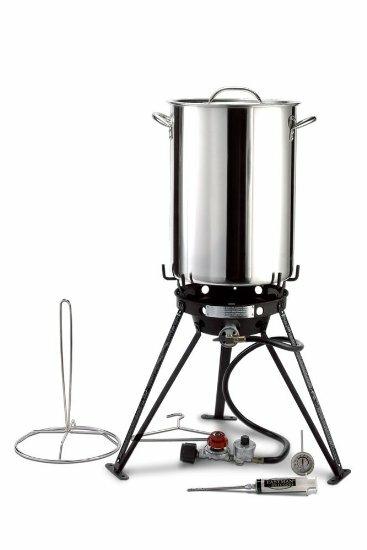 This turkey deep frying kit from Eastman Outdoors puts out an extremely powerful 65,000 BTUs of power, meaning that it will heat your oil up very quickly and not struggle to maintain the correct temperature. The speed at which the oil heats up is one of the serious advantages to deep frying a turkey outdoors vs. indoors. Propane deep fryers are far more powerful than the electric indoor ones, which is amazing if you are not so organized on that busy holiday day! 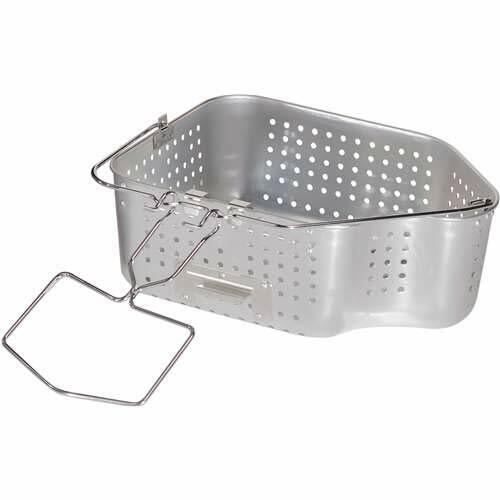 This Eastman Outdoors Frying Kit also includes a safety shut-off feature which is useful if you happen to forget to shut the machine off after taking your turkey out. 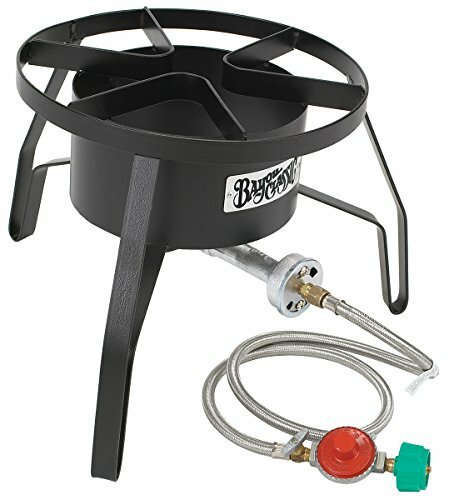 It’s obvious that this company is serious about safety and the whole turkey fryer has been designed with this in mind. 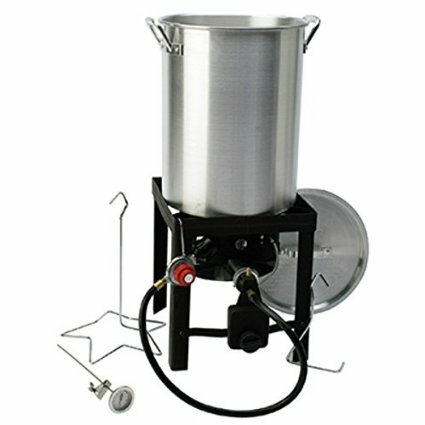 This outdoor deep frying kit includes a stand, 65,000 BTU fuel-saving burner, pot + lid, poultry stand, lift hook, thermometer and marinade injector. 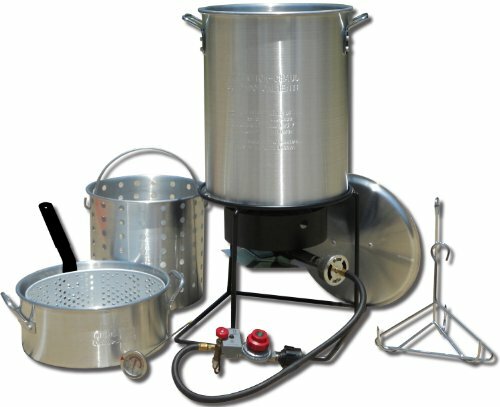 In short, everything you could possibly need to deep fry some delicious turkey! Crisp on the outside and moist and delicious on the inside. 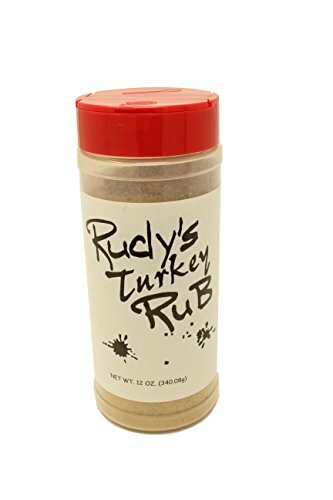 You can cook a small-medium turkey in this thing in under an hour! 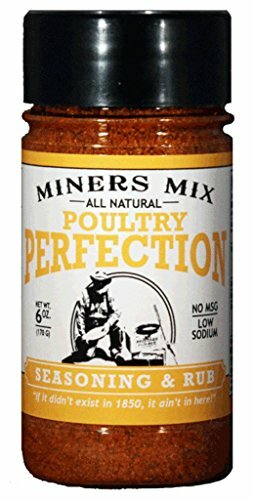 Includes everything you need to deep fry turkeys except the propane tank. If you’re looking for an outdoor cooking set that runs on propane to deep fry turkey, this Eastman Outdoors Set is a nice choice. The pot is top-quality stainless steel and should last you for years. Some reviews of the cheaper sets mention thin pots that cracked or had holes in them after only a couple of uses. This shouldn’t be a problem with this Eastman turkey fryer. Clean-up is also really easy with stainless steel, as opposed to some of the cheaper pots where it can be difficult to completely get rid of the oil film. 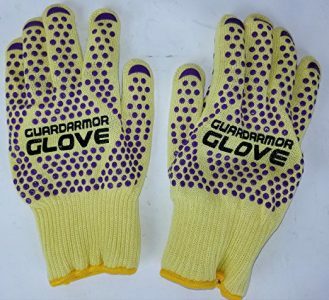 The Price: is it Worth it? The main drawback of the Eastman outdoor turkey fryer is the price. The Eastman Outdoors Stainless Steel Outdoor Cooking Set is more expensive than most other kits. But, you get what you pay for and the Eastman turkey fryer should last you for years!